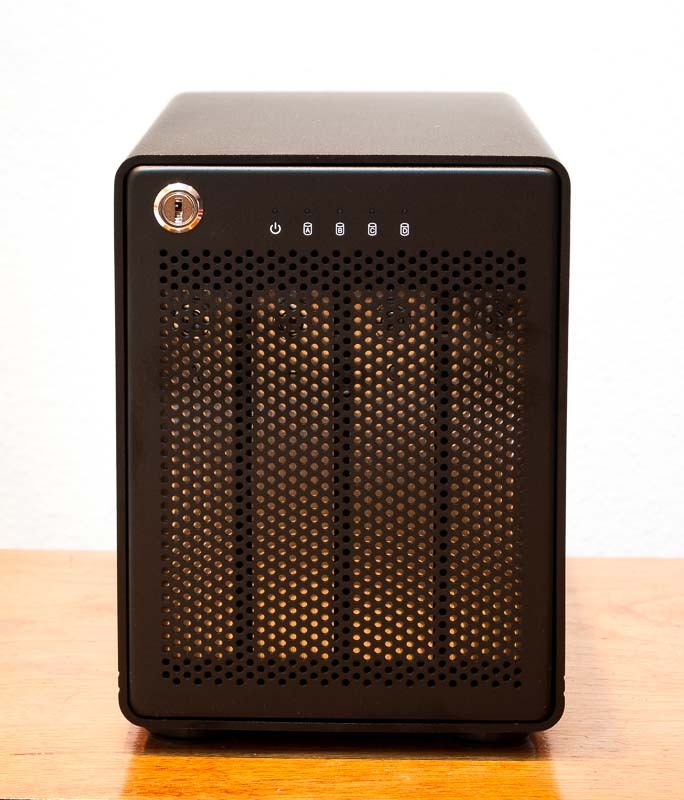 The OWC ThunderBay 4 is a Thunderbolt 2 hard disk enclosure that holds up to 4 drives. The enclosure does not have hardware RAID support (although this is possible with software) and the disks appear individually to the operating system. In other words this is a JBOD (“just a bunch of disks”) enclosure. ThunderBay 4 – a four bay Thunderbolt 2 hard disk enclosure made by Other World Computing (OWC). Note that the “ThunderBay 4” is an updated version of the “ThunderBay IV” enclosure. The primary (and perhaps only) difference is that the enclosure now supports Thunderbolt 2 connections. I purchased my ThunderBay 4 because I was tired of juggling individual drives in my USB dock in conjunction with my Macbook Pro. Previously I used a Mac Pro with 4 internal drive bays but I had switched to a laptop for portability. I ordered the 12TB version that includes four 3TB Toshiba consumer drives (model number DT01ACA300). The enclosure can also be purchased in other drive configurations as well as diskless. I ordered the ThunderBay directly from Other World Computing (OWC). Ordering was straightforward on their website although I needed a user account to purchase (very annoying). My shipping address was different from my billing address and an OWC service rep gave me a call within an hour to confirm. The free shipping was extremely fast. I had ordered on a friday afternoon and the package was delivered by the middle of the next day. It helps that I was only one state over from Illinois but I had still expected at least a day for OWC to process the order before the package was ready for Fedex. The ThunderBay was double boxed and it was the best packing job I have ever seen (much better than B&H or Amazon). Everything fit snuggly within the delivery box with no possibility of slipping. The 4 hard disks came already mounted in their drive sleds but they were not installed in the enclosure. Instead they were wrapped in an anti-static bag and surrounded by an extremely sturdy “air mattress” which kept them separate and away from the box walls. The plastic was very thick unlike the thin air bags that come in Amazon boxes that are easy to tear. Packaging for the ThunderBay 4 enclosure. Very easy. Basically, open the front grill with the enclosed keys and slide the drives into each bay. Lock the drives into place by hand tightening a mounting screw at the top of each bay. Note to manufacturer: please ditch the keys needed to access the drive bays — it doesn’t add any security and it’s just another item that I need to keep from losing. I used Apple’s Disk Utility to do a full format of each drive (to do a full format, erase the drive and use the security option to write zeros over every bit). This takes about 5 hours to do one 3TB drive but can be done in parallel by opening multiple copies of Disk Utility (in terminal type “open -n /Applications/Utilities/Disk\ Utility.app/”). I also used Disk Utility to setup the device in various configurations (individual disks and RAID 0 sets) for testing. I’m sensitive to noise and online reviews of the ThunderBay suggested that the drive is very quiet (an important factor in my decision to purchase it). However, I found that the ThunderBay’s fan is very noticeable and I was disappointed that it was not quieter. Without having a sound meter, I’ll describe it as being a little less loud than a Macbook Pro or iMac with the fans running full tilt. In a quiet room you will hear the fan unless you put the device far away. It’s nowhere near as quiet as a Mac Pro (which is silent to my ears). However it is much better than my old ReadyNAS which was unbearably loud. As far as I can tell, the fan seems to run at a constant speed regardless of the load on the hard drives while the computer is on and connected. However, if the computer is sleeping the fan will eventually shut down. The hard drives power down when not in use. Note that this test was done with disks empty (hard disks slow down as data is added). 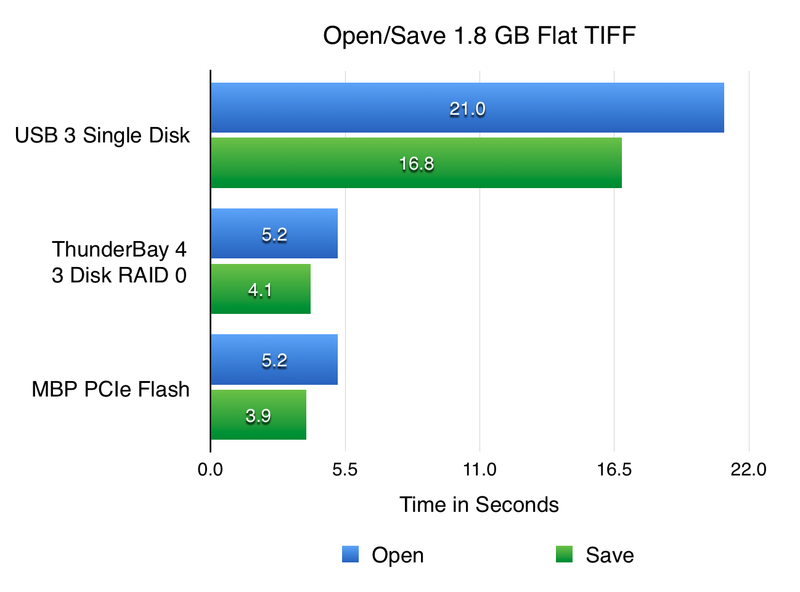 The results are pretty much what I expected: a single drive is comparable to speeds in an internal bay of my Mac Pro, and multiple drives in RAID 0 set scale not quite linearly. With 4 drives in RAID 0, it’s about as fast as the internal flash memory on my laptop. 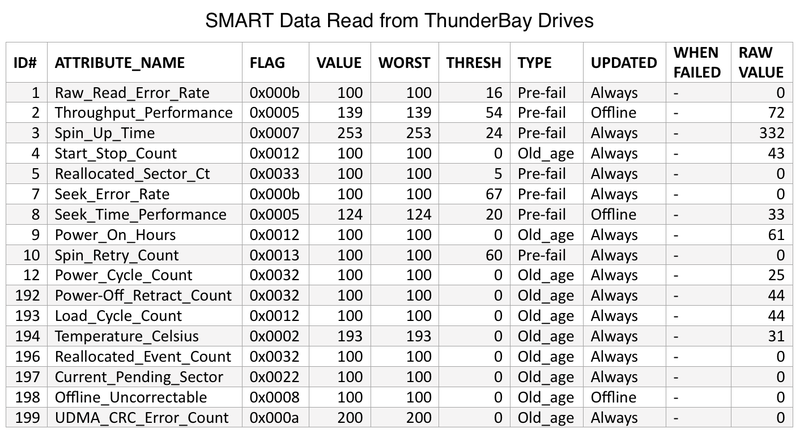 For the following tests, all timing results for the Thunderbay 4 are obtained from the 3 disk RAID 0 set. Timing was done by hand and is probably accurate to within 1/2 second. I used Lightroom to process 111 RAW files from my Canon 5d Mark II (about 25-30MB each) and export 16-bit tiff files (170 MB each). 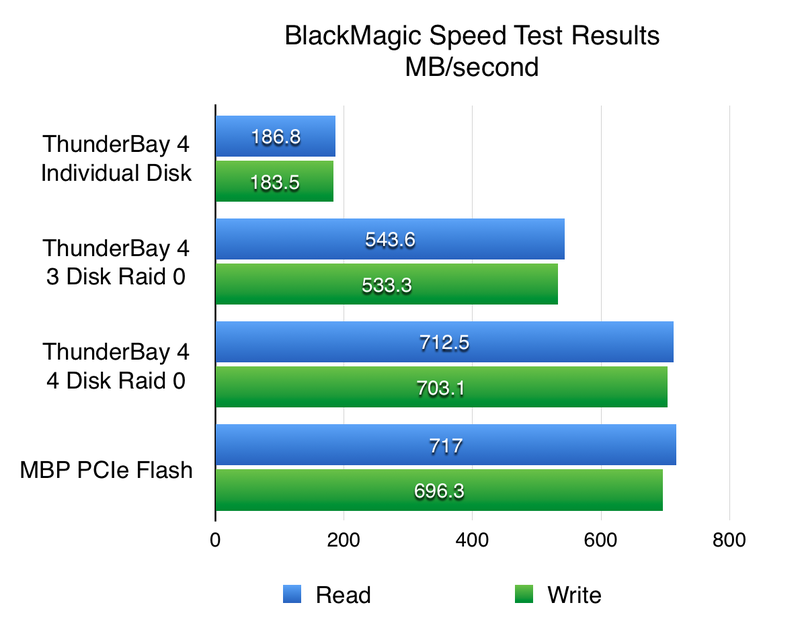 As might be expected the internal flash memory was the fastest followed closely by the ThunderBay 4. The USB3 drive was 50% slower than the internal flash drive. However the gap is surprisingly small compared to the BlackMagic results. This test involved opening and saving in Photoshop a large uncompressed TIFF file (1.8GB) with just a single layer. 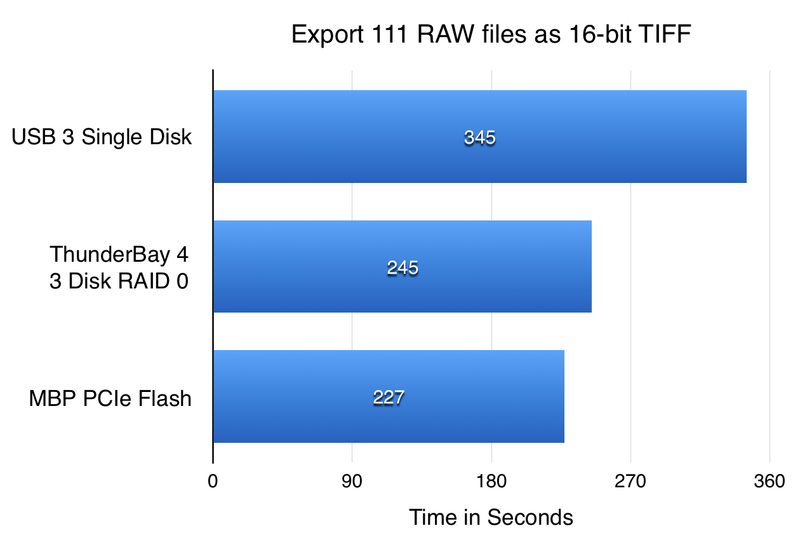 In this case the results mirrored the BlackMagic times and both flash and ThunderBay were about 4x faster than the USB. This test involved opening and saving a large TIFF file (2.7 GB) which is a composite image made from 3 stitched RAWS with multiple layers added in photoshop for processing. The base image is uncompressed but the layers were compressed with RLE. From the times we see that the ThunderBay is comparable to the internal flash memory. It actually comes up a little faster on the open but this may be due to measurement variance. USB3 takes 3 to 4 times as long. This test involves the same file as test #3 but using ZIP layer compression instead of RLE. 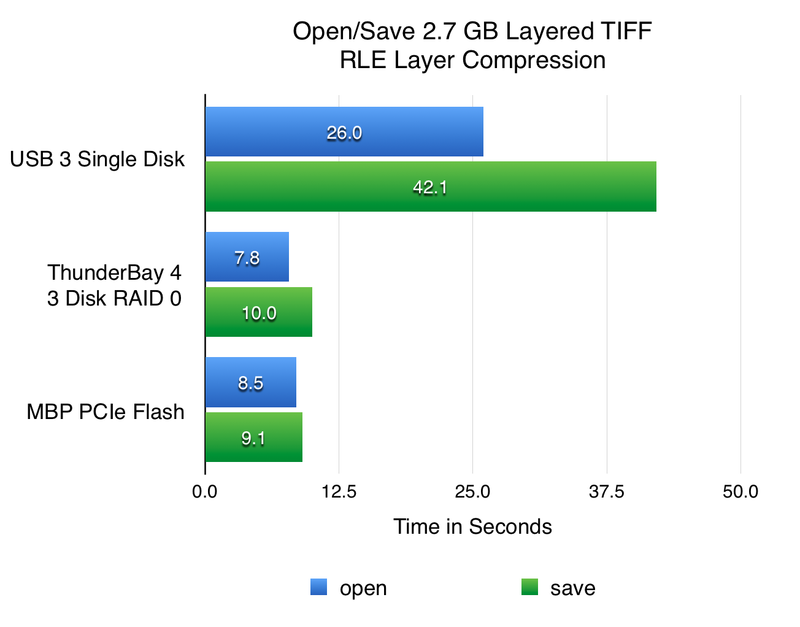 ZIP compression saves significant space as the file is only 1.5 GB instead of 2.7 GB, but increases processing time during open and save operations. From the graph we see that there is almost no difference between the three storage devices. In this case, CPU processing is the limiting factor not the storage I/O bandwidth. 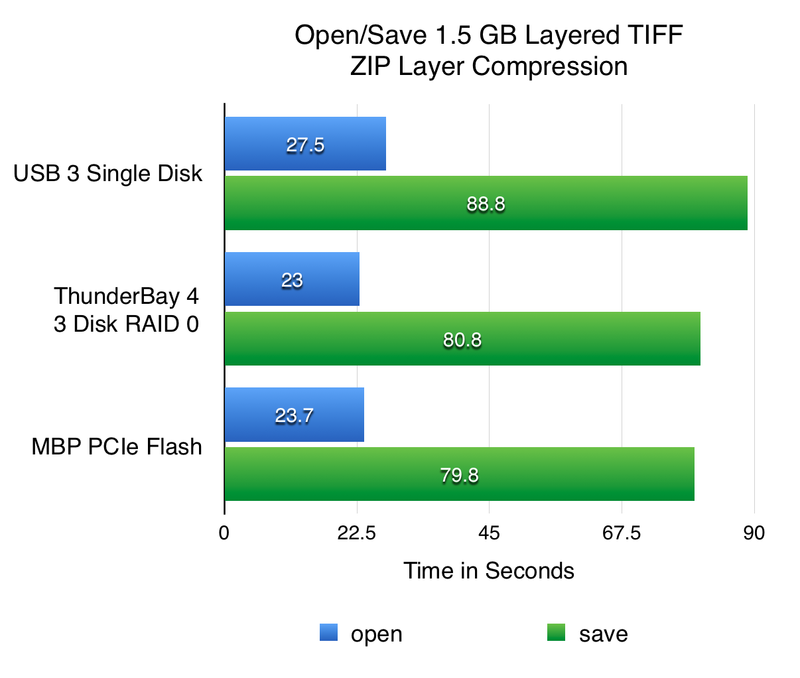 Given that disk memory is cheap, I would avoid using ZIP compression if possible. For this test, I converted several thousand tiff files to jpegs in Lightroom and then measured the drive temperatures after approximately 30 minutes have passed (while the conversion was still ongoing). 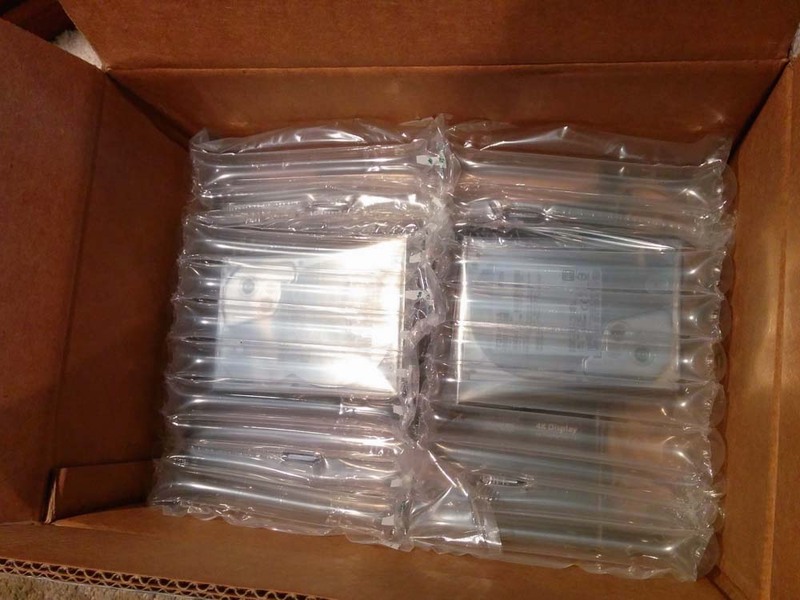 Overall the drives stayed cool and are well under the manufacturer’s operating limit of 60C. As I measured the temperatures repeatedly, I noticed that the middle two drives were usually 1 degree cooler than the outer two disks. My package didn’t have a CD but rather a slip of paper with a URL link to where the programs could be downloaded. However they were not at the stated location — I emailed customer service and they sent me a working link within a day. The bundled software (Intech SpeedTools) can also read the SMART data but doesn’t appear to show the raw values of attributes. After using the ThunderBay 4 for two months now, I’ve noticed that it occasionally disconnects and may cause my computer to hang (necessitating a hard reboot). I haven’t tracked down the cause but it usually occurs when I’ve got the ThunderBay connected and powered on but not actively accessing the disk. The disconnects and forced reboots are very annoying but otherwise the device works great. Lloyd Chambers at macperformanceguide.com believes this may be due to loose/poor fit on the thunderbolt port on the mac end. I’m not convinced yet that this is my problem but I plan to test this hypothesis (by getting an official Apple cable and working with several computers). Due to extended travel, I never purchased an additional thunderbolt cable to track down my disconnect problem. However, I’ve upgraded from Mavericks (10.9) to Yosemite (10.10) and have not had a disconnect yet. As of 11/26, I’ve still not had any disconnects so I think it’s safe to assume this has fixed the problem. The ThunderBay 4 is expensive for a JBOD box that just holds drives. However alternative Thunderbolt enclosures (e.g. Caldigit T3 / T4, Lacie 5Big, DataTale) are just as costly. Thunderbolt enclosures with hardware RAID are even pricier. In terms of speed, the drive enclosure is terrific and met my expectations for throughput. I have my main image library setup on a three drive RAID 0 array and this performed very similarly to the internal PCIe flash storage on my MBP. In terms of noise, I wish the drive was quieter but the noise level is acceptable and many enclosures are worse. The enclosure supports SMART status so that you can monitor the health of your drives. Given that very few Macs have internal bays, this is a very useful feature (SMART is not supported on USB for macs). Hard drives are kept cool in the enclosure and temperatures did not exceed 35 degrees Celsius in my tests. I’ve experienced disconnect problems with the ThunderBay 4. I’m still trying to track down the cause and if there is a simple setting fix. I found this article while troubleshooting my TB4. Today it disconnected and no longer mounts to any of the 4 drives had in a RAID. Did you ever find your problem? Jes — I haven’t tracked down the problem yet (busy with travel and a house move). However, when I did have a disconnect, none of the drives would be visible without a hard reboot. Just unplugging the TB4 and replugging it in did not work. Stephen and Jes, I’ve had several of these new OWC boxes, both with power switches, and the newer versions that come without power switches. When I first encountered the drive spinning down and dismounting when not in use I contacted OWC support, and they said it was because I was not using the USB cable supplied with the unit. Although I strenuously object to ANY drive power supply design that is dependent upon some very critical voltage or termination provided by a special cable, sure enough…. that was the cause. And using the OWC-supplied cable solved the problem. I love the unit, but I still consider this a serious design flaw. Power switches on hard drives have been working fine for me for over 30 years. Why take them away and replace them with something “automatic” that is clearly flawed? If OWC or Newertech were manufacturing electronic parts for automobiles that malfunctioned and potentially caused crashes, they would simply be out of business.